Another perspective on the troubled relations of the East Asian neighbors. Japan-Korea tension has reached a peak in the last year. South Korea’s president, Park Geun-Hye, refuses to meet with Japanese Prime Minister Shinzo Abe, even after a year in office. Park has met with Premier Xi Jinping of China, but not the Japanese leadership – even though Korea and Japan are both U.S. allies, and despite China’s controversial expansion of its air defense identification zone at both Korea and Japan’s expense. When U.S. Secretary of Defense Charles Hagel went to Japan in the fall of last year to strengthen the alliance as a part of the U.S. pivot to Asia, it was widely read in the Korean media as a snub of Korea. In a fit of pique, Park jetted off to Southeast Asia to pursue a separate, counter-Japanese diplomatic track in Asia. This was roundly cheered in Korea. Abe, for his part, has visited the always-controversial Yasukuni Shrine and said nothing on recently reiterated Japanese textbook claims to the Korean-controlled Liancourt Rocks. He has repeatedly allowed the creepiest right-wing elements of his electoral coalition to overwhelm good sense in public without rebuke. The most recent disturbing, atrocity-denying outburst has come from NHK television. It is long overdue for Abe to make a high-level statement against this stuff. China, the major geopolitical beneficiary of such tension, has happily stoked it by constructing a memorial to Ahn Jung-Geun at Park’s request. Ahn assassinated Hirobumi Ito, an early prime minister of Japan and governor-general of occupied Korea at the time of his death (1909). The memorial was built on the location of the shooting, which is today in China. Inevitably, Ahn is denounced as a “terrorist” by the Japanese and celebrated as a “freedom fighter” by Koreans. Korean-Japanese competition has even arrived in U.S. domestic politics, where intense Korean ethnic lobbying in the state of Virginia produced legislation that Virginian textbooks should use the name “East Sea” instead of the more widely used “Sea of Japan” to denote the body of water between Korea and Japan. All of this significantly complicates the U.S. pivot to Asia, the U.S. confrontation with North Korea, and America’s slow-boiling competition with China in the western Pacific. Korean tension with Japan is a major stumbling block to a more coherent American posture in East Asia. It is arguably the single most important reason for the lack of an Asian NATO. South Korea simply will not accept alignment with Japan, forcing the United States to maintain parallel bilateral alliances with each, rather than a more efficient single multilateral structure. Indeed, were it not for the U.S. alliance, if Korea, Japan and China were acting alone, I would guess that Korea would align against Japan in a Sino-Japanese conflict. Korean dislike for Japan is that intense. By way of example, read this (in Korean), in which the sweater of a guest on a Korean TV show, which looked vaguely like the Japanese imperial flag, forced the guest to apologize to offended viewers, or this, in which a major Korean paper actually suggests Japanese samurai might invade the Liancourt Rocks. The question then is why the Korean disdain for Japan is so high that even sweaters are offensive and fantastical samurai invasions go unremarked. I have said many times before (here, here) that Korea’s grievances with Japan are very legitimate: Japan sexually enslaved Korean women into wartime brothels; it attempted to erase Korea as a cultural entity by coercing the use of Japanese, even to the point of re-naming people (there are still Koreans alive who went through this); Japan has not really come clean about the empire and the war – a point made not just by Korea, but by China and the U.S. as well. But Koreans do not stop there; they go over-the-top with things like the “Sea of Japan” re-naming campaign with no obvious point other than to provoke Japan, unfounded claims that Japan wants to invade Korea again, equating bad Japanese behavior in Korea with the far-worse Holocaust, or that Liancourt is worth going to war over – even though a Korean use of force against Japan would almost certainly result in a U.S. departure from South Korea and dramatically reduced Korean security. Other victims of earlier Japanese imperialism do not talk like this, and I think a lot of well-meaning Japanese, who do recognize what Japan did in Korea, are genuinely baffled by all the vitriol. 1. Koreans have always been sharply anti-Japanese since the war; we just did not see that until democratization twenty-five years ago made expression of public opinion easier and less manipulated by the government. Japanese colleagues often note to me that Korea did not start talking this way until the last few decades – the implication being that tension with Japan is the politicization of something no one cared about earlier. That may not be so, because of what social scientists call “hidden preferences” – under dictatorships, there are strong incentives to keep your true feelings to yourself. Opposition to regime preferences might land you in jail or worse. Korea was such a dictatorship until the late 1980s. So moves by earlier Korean leaders to deal with Japan may not have been approved of by a population which, however, was unable to impact policy. For example, there were mass protests against the Japan-Korea normalization treaty of 1965. Were Korea a democracy at the time, the treaty would likely have collapsed just as an intelligence sharing pact did two years ago. If this hypothesis is right, Koreans really do feel threatened by Japan and reconciliation is far away. 2. The late 1980s/early 1990s rise of intense anti-Japanese feeling coincides with the passing of the first generation of South Korea’s political and business elites. There is a sharp ongoing historical debate about just how much South Korea’s first generation collaborated with the Japanese occupation. The founders of the chaebol are often particularly suspected, but it is no stretch to suggest that only collaborators would have had the education, political connections, wealth, skills, and so on to enter the postwar elite. This idea would suggest that as these guys died out and were replaced by a second, untainted post-colonial generation, that the new generation wanted to dig into the past the way earlier elites did not. 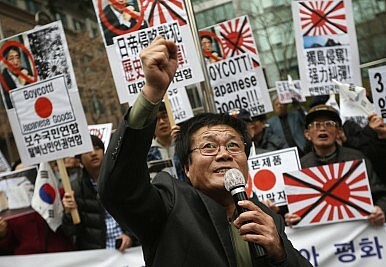 Vitriol today on Japan may reflect embarrassment at Korean collaboration yesterday during the occupation. 3. When South Korea democratized, it needed some kind of legitimating story (unnecessary under authoritarianism). Because of corrupted institutions, “deep state” elitism at the top, and a debilitating legitimacy competition with the DPRK that confuses loyalties, South Korea has struggled to connect with its own citizenry. It cannot be the anti-DRPK it should be, because not enough South Koreans share a strict “enemy image” of North Korea. Instead South Korea has fallen back on Japanophobia, being the anti-Japan, to legitimate itself, because all Koreans, north and south, can agree that Japan was bad. All three of these are probably somewhat correct, but I would tilt toward the third. All add important psychological elements that help explain Korean hyperbole on Japan beyond otherwise reasonable concerns about history. Hostility toward Japan is not just a political posture, but is part of the South Korean political identity. Washington in particular should stop pretending that this is something that it can resolve with its typical, the-hegemon-is-here-to-save-the-day interventionism. It can’t. An upcoming visit by Xi Jinping to South Korea will likely leave much unsaid.